Apply Now for EMS Merchant Services! Get The Best Rates Guaranteed! 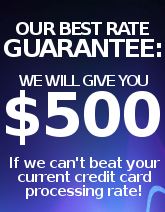 We'll LOWER YOUR RATE or give you $500 if we cannot beat it! Ask a representative for details. Note: The information you provide will be used only to contact you.